The alarm sounds at 3am. Still bleary-eyed after 5 hours of sleep, I stumble out of bed, pull out the coffee grinder and French press which are standard items in my bike trip travel bag, fire up the hotel coffee maker, and start the force-feeding which precedes my biggest rides. Three hard boiled eggs, one high-protein sprouted wheat bagel, almond butter, homemade apricot jam down the hatch. It’s hard to consume this many calories when my body thinks it should be sleeping, but the caffeine helps with getting it all in. I cover myself from head to toe with sun block, douse my nether regions with lubricating cream, and pull on my shorts, sports bra, jersey, wind breaker, socks, shoes, gloves. Make sure my tires are full, my lights are attached to the bike, water bottles are filled, electrolyte replacement and sunglasses are in my pocket, and food for the day is stowed. 3:45, it is time to roll to the start. I check in, and mingle in the sea of other riders. 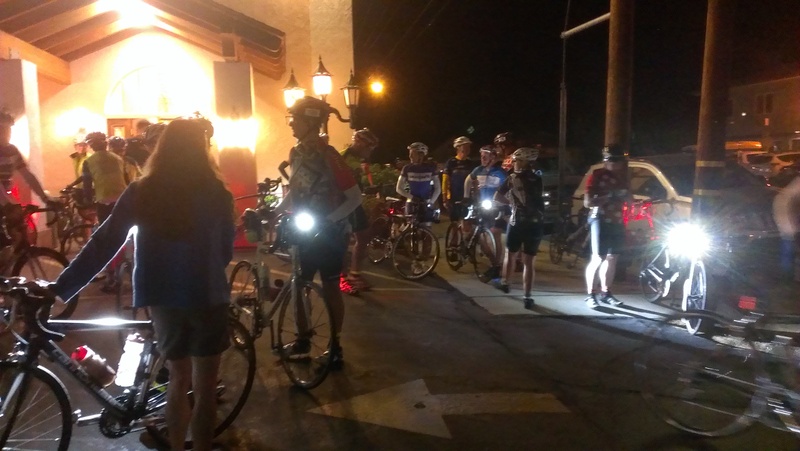 114 people signed up to ride this White Mountain Double Century, rated as one of the “extremely difficult” rides in the California Triple Crown series. 14 of these, myself included, had signed up to do the ride two days in a row, giving new meaning to the “Double Double”. At 4am, there was a mass start and we’re off in a tangle of wheels, clicking of pedals, and flashing tail lights. 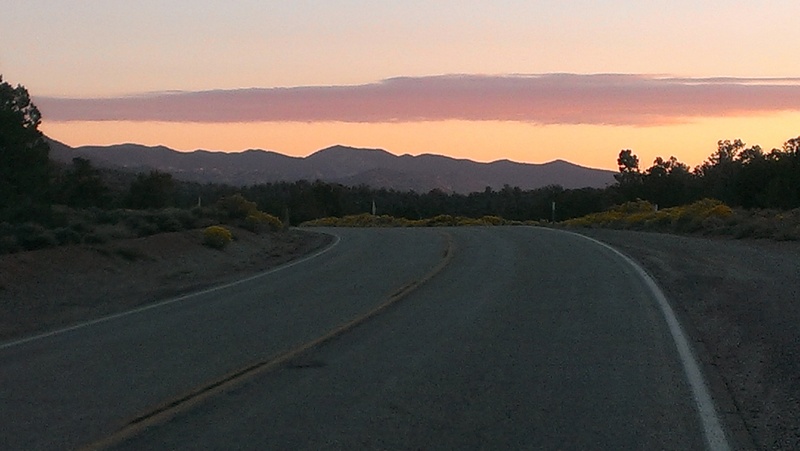 This ride begins with nearly 15 miles of flat road. Riders jockeyed for position, chatting with others as they found their place in the pecking order. The stronger, faster people quickly pull ahead, and some of us rapidly drop off the back of the pack. I manage to stick with the middle for awhile, enjoying the Sierra Nevada stars and the chilly early morning air. We finally make the first turn, and the climbing begins. 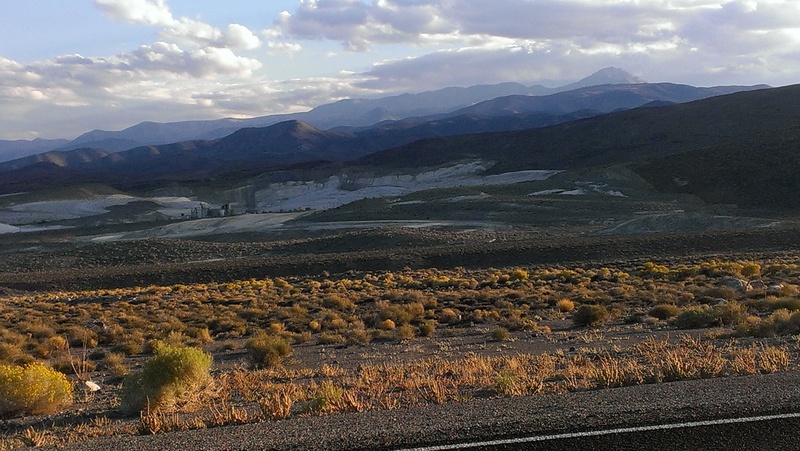 The route takes us up route 168, makes a turn onto White Mountain Road, and climbs until the road ends. I climb in the dark, keeping a steady cadence, feeling good. I pass some riders, some pass me. I’ve long since lost the friend I started with who is a slower climber. We pass through a short section where the road narrows to a single lane, and I can see the outline of cliffs in the twilight before dawn. Suddenly there is a cacophony of crickets, followed by a burst of birdsong. Morning comes abruptly to the mountain, and I stop to take a few pictures of the brightening sky. I note the sign indicating 7000 feet elevation, and realize that my hands and feet are freezing even though my core is warm. 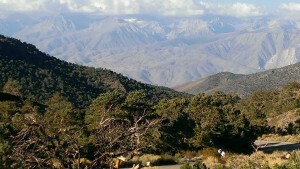 The temperature is 47 degrees, a far cry from the 65 degrees at our starting point at 4100 feet in Bishop. I make the turn onto White Mountain Rd., stop at the aid station to refill my water bottles and gulp a few pieces of melon, and I’m off to continue the climb. 8000 feet. 9000 feet. While the average grade is 7.7%, there are many stretches where the grade is 10% and several short periods of 15% or more. A few times I can’t manage to pedal faster than 3mph, and I get off the bike and walk for a bit. The air is thinner up here, and getting off the bike leads to a few moments of dizziness and wobbly legs. I focus on breathing, holding back the mild altitude induced queasiness with sheer will. I’m forcing myself to take a sip of salted water every 5 minutes, but I just can’t bring myself to eat. 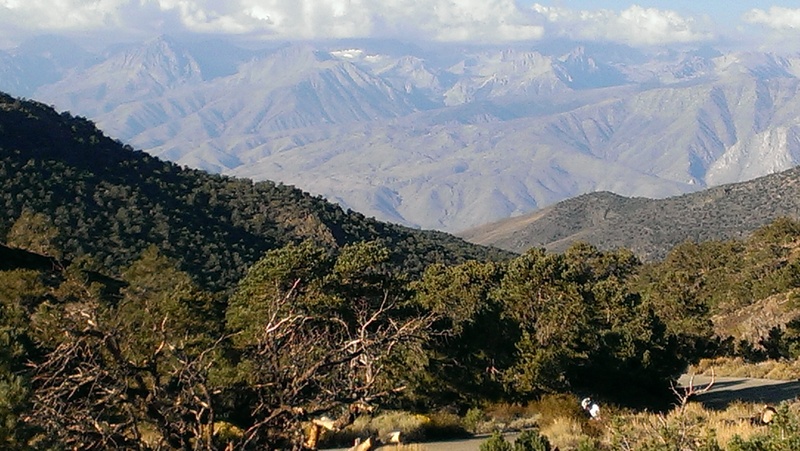 Every turn brings the reward of a new spectacular view of the Sierra Nevada range to the west, and the rest of the White Mountain range to the east. Finally, I reach the summit of the road and my altimeter says 10,077 feet above sea level, higher than I’ve ever been on a bike. We’ve climbed 6100 feet in approximately 20 miles. I check in at the top, refill my bottles, and start on down. The queasiness is becoming more insistent, and a slight headache is starting. I’m eager to reach a lower altitude as quickly as possible. The road is steep, curvy, no guard rails, with some gravel and debris. While other riders zoom past me at more than 40mph, I constantly flutter the breaks to stay in my comfort zone. I pass my friend about 1.5 miles from the summit. She is struggling with altitude sickness, cramping, and fatigue but is determined to get there. We agree to part ways for the day, and I keep on with my descent. More melon and more water at the bottom, and I’m off again. The next 10 miles is one of the most scenic and glorious stretches of road I’ve ever been on. 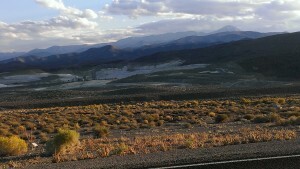 The road passes through fields of yellow flowers, bristle cone pines, and sweeping vistas of the Nevada dessert below. It’s nicely graded, well paved, and nearly untraveled at 9:40 on a Saturday morning. I enjoy the well deserved break from climbing and the reprieve from higher elevation as my stomach gradually settles and the headache goes away. I catch glimpses of another rider ahead of me, but I can’t catch her as I pedal my way across a huge valley and start the climb up Gilbert’s Pass. 2000 feet up to the summit, I’ve now climbed 8100 feet in 67 miles. A quick stop at the top for more water, more melon, and a reapplication of chamois cream, and I’m off for the next descent into the dessert. As I drop down to 5000 feet, the air gets thicker and warmer. The road goes on forever in a valley stark with chaparral and sage brush. The White Mountains are now on my left, another nameless (to me!) range on the right. Cows and horses graze in irrigated fields between stretches of dessert emptiness. It’s a long and lonely road to ride solo, and I settle into a mellow pace enjoying the heat of the sun on my back. 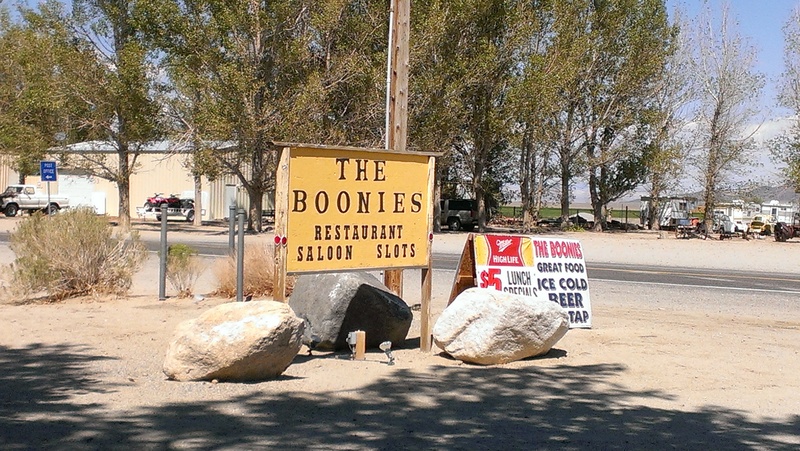 The lunch stop is in “The Boonies” of Dyer, Nevada. I run into some friends, and leave with them after a short stop which includes a turkey sandwich. The company breaks up the monotony of the dessert road, and we banter and chat while keeping a pace line into a slight head wind. It gets progressively warmer, and a strawberry banana smoothie plus a sock full of ice over my neck are welcomed luxuries at a rest stop in the middle of nowhere. The organizers had brought a portable generator and a blender, and had set up folding chairs under a shade tent. I take about 20 minutes to enjoy the relative cool and head out again. Some of the group are faster and go on ahead, one drops back, and I am once again solo in the dessert. The rest of the ride is uneventful. Sunset is spectacular and brings welcome relief from the heat of the day. I hear coyotes off in the distance, but never see any. The evening crickets serenade me as the miles pass under my wheels. The final 30 miles back into Bishop is a long, straight stretch with a slight downhill. I make good time despite the slight head wind, but the road seems to go on forever. There are tail lights in front of me and I can see headlights behind, but I am solidly in the middle the whole way. I roll back into the start at 10:15pm, 18 hours and 15 minutes after I began. I’m tired, but overall feel good and strong. The first of my friends is already in and showered, having finished in less than 14 hours. The next comes in at 10:56 and the last at 11:10. I go back to my hotel, shower, eat, and take a 3 hour nap. 3:00am, the alarm goes off and I start all over again. This time, there are fewer than 15 people at the start. Everyone is quieter than the day before. Coffees are clutched closer, windbreakers pulled tighter. Several people on the roster never start, including the friend I was planning to ride with on day 2. We’re off promptly at 4am. The intrepid riders who are willing to subject themselves to a second day of altitude, climbing, and heat are stronger and faster than I am, and the few who are riding it for the first time are on fresh legs and a good night of sleep. I quickly fall off the back of the pack, and resign myself to a full day of solo riding. I feel pretty strong at first, and enjoy gawking at the stars revealed by the absence of headlights and blinking red tail lights. 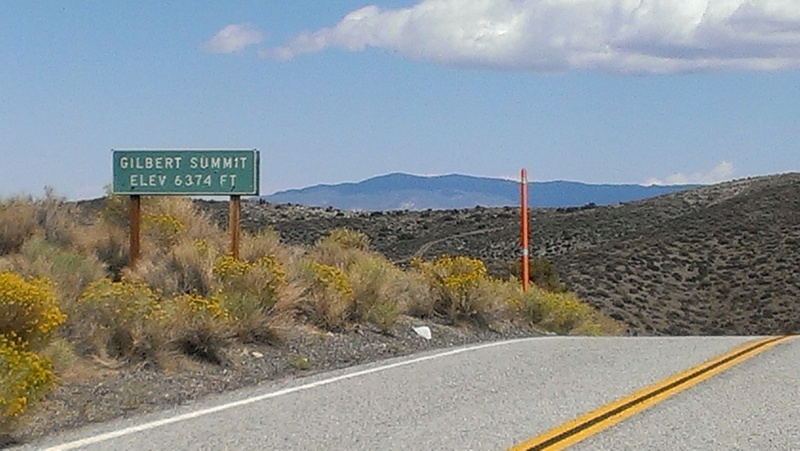 I make the turn onto route 168 for the second time, and start to climb. It’s colder on Sunday, with a stiff wind coming down the mountain. I pedal with all the strength I have, but my speed becomes slower and slower. I pass the 5000 foot mark and keep pedaling. My brain is fine, my body feels fine, but I’m pedaling and going nowhere. The cricket song begins, then the birdsong. As the sky becomes brighter, I am still 5 miles behind and 2000 feet below where I had been on Saturday morning at daybreak. I hit a 9% grade, and my speed drops to 2.5 mph. I get off and push the bike over the steep part, get back on, and keep going. I’m in my bottom gear, the wind is in my face trying to push me back to where I’d begun, and my speed is down to 3.5mph on the 6% stretches. I finally see the 6000 foot marker at 7:30am. For the third time this year I am facing a decision. I really want the experience of completing the Double Double but I’m only 23.5 miles into the ride and fatiguing fast. I especially want to ride that glorious downhill stretch after White Mountain Rd. for the second time, though I’m less enthusiastic about a long solo dessert ride. I figure I can make it to the top of this rise at 7000 feet and down the other side, but I have real doubts about whether I can get up the next 2000 foot climb to Gilbert’s Pass. It is quickly becoming evident that I’m unlikely to make it another 175 miles. Ultra distance riding is filled with life lessons, and one of them is knowing when it is time to pack up and go home. It is always a difficult decision to walk away without finishing what is begun, but riding at elevation in the dessert is not without risk. I decide to turn the bike around and head back to Bishop while I can still get there under my own power. I stop and take some pictures of the sunrise over the Sierra Nevada range, get back onto the bike, and start the descent. This downhill is the first I have seen of this road in daylight, and I am shocked at how steep it is. Climbing in the dark, you have a sense of working hard but no visual cues to how fast the road ascends. One of my friends is working an aid station on Sunday, and he drives by as I make my descent. He stops to see if I am OK and offers a ride which I refuse. At the very least I’m going to get myself and the bike back to town on my own! 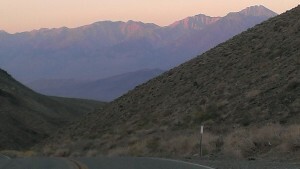 The rest of the descent is uneventful, but I fatigue quickly on the 15 mile flat stretch back to Bishop. It isn’t long before I regret passing up that ride back to town, which validates my decision to turn back. I finally make it back to my hotel at 9:15am, happy to see my friend and the shower. We clean up, pack up, check out, stop for breakfast, and start the long drive back to San Diego. There have been only three times when I’ve been unable to finish the ride I started, and all of them have been this year. In any endurance activity you never really know where the limit is until you hit it, and attitude truly IS the difference between an adventure and an ordeal . The first time, I rode over 110 miles with a nasty case of bronchitis before deciding I had had enough. The second was on a 1200k when I rode another 250 miles after an early morning crash, finally setting myself too far behind the clock to have an official finish. This was the third. So what happened this time? I’m not sure. When I climbed Mt. 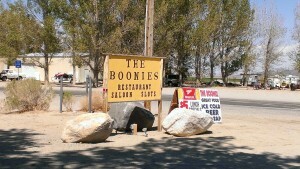 Whitney a number of years ago I found I couldn’t exert and eat at the same time once I was above 8000 feet. I had the same experience on this ride. I typically eat mostly protein for the first 100 miles of a ride and this time I was only able to eat simple carbs once I was at higher elevation. The mild nausea of high altitude stayed with me and while I was never in danger of vomiting, I couldn’t bring myself to eat more than fruit. I drank tons of water, supplemented electrolytes and salt routinely, and had no obvious electrolyte or hydration issues. Daytime temperatures were well above 90 degrees, and while I didn’t feel uncomfortably warm most of the day the heat certainly affected my energy level. That ice sock felt crazy good, even though I wasn’t conscious of overheating. Saturday’s ride was my fastest double century ever, despite being one of the most difficult I’d ever done and the only one with high elevation. The ride was timed with a firm 19 hour limit for an official finish, and I pushed myself hard to get in under the wire with 45 minutes to spare. I suspect my level of exertion was greater than I realized on the first day, and that I didn’t leave enough in reserve for a second hard day of riding. In dancing with extreme endurance, there are always times when the steps are too complicated and the dancer trips or falls. While I didn’t complete the Double Double, I definitely learned some things about how my body works at altitude and discovered that I need to learn more about how to get enough calories when solid protein makes my stomach do flippy-floppies. I had planned to ride 400 miles with about 20,000 feet of climbing and instead completed 247 miles and about 15,000 feet of climbing. I had one fantastic day on the bike, completed my fastest double century ever, and left Bishop feeling as though I’d had an adventure rather than an ordeal. The rest of this year’s training will be about figuring out the next phase in my nutrition plan, finding a solution to painfully bruising ischeal tuberosities, and building strength so next year I can do it again and finish both days strong!